Many people butcher the story of Noah because they misread what the Bible actually says. 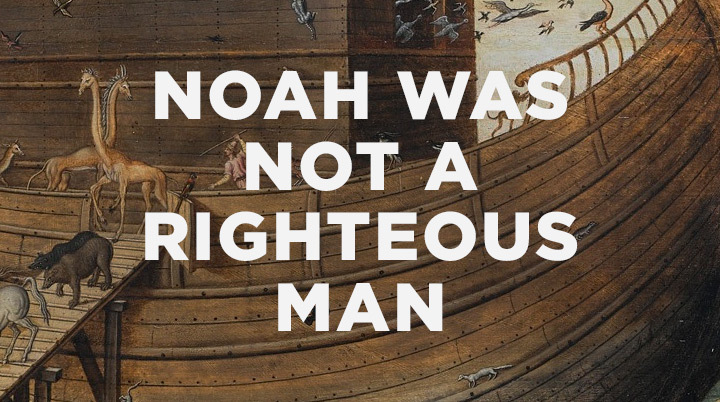 Did God choose Noah because he was a righteous man? This post is about one of my pet peeves. It bugs me so much that I have gone through my kids’ picture Bibles over the years with a Sharpie, scratching out the error so my kids can get the story straight. With all the buzz about Noah lately, it seemed like a good time to connect Noah to the gospel of Jesus Christ. The most common way Christians butcher the story of Noah is by misreading what the Bible actually says. The story is wrongly told that there were a bunch of bad guys who drowned and one good guy who got a boat. The moral of the story is that if you are a good guy then God will save you from death and wrath. Slow and careful Bible reading is really important everywhere, including here. The order of events is very important and deliberate. First, Genesis 6:5–7 states the total depravity of everyone on the earth with one of the most negative declarations about human sin in all of Scripture. We are told that God saw that every person was only evil all of the time. God was grieved that he had made humanity because they filled his heart with pain. This statement does include Noah, who was simply one of the sinfully wicked men on the earth who grieved God. Everyone was a sinner in Noah’s day, just like everyone is a sinner in our day. Noah did not begin as a righteous man, but rather he began as a sinner not unlike everyone else on the earth in his day. The only difference between Noah and the other sinners who died in the flood of judgment was that God gave grace to Noah. Noah was not a good guy, but a graced guy. Beautifully, the word “favor” is the same Hebrew word for grace that appears here for the first time in the Bible. It’s the same word that is echoed repeatedly by Paul and other authors throughout the New Testament as they proclaim that salvation is by grace through faith alone. Everyone was a sinner in Noah’s day, just like everyone is a sinner in our day. God had no good person to work through to accomplish his plan of redemption. God worked, as he always has, by saving an undeserving sinner through grace, thereby enabling them to live a righteous life by grace, as is taught in the next verse. The only difference between Noah and the other sinners who died in the flood of judgment was that God gave grace to Noah. Indeed, Noah was a blameless and righteous man who, like Enoch, “walked with God” (Gen. 5:24). But Noah was only this sort of man because God saved him by grace and empowered him to live a new life of obedience to God by that same grace. The good news of Noah is that a bad guy received God’s good grace, and that same God still saves the same way today. Tags: God's Grace, Grace in the story of Noah, Mark Driscoll, Noah finds grace in the eyes of the Lord, Was Noah a good man?, Was Noah righteous?, Why did God choose Noah? An excellent and thoughtful observation on the Noah story! Thank you. Your welcome! Glad you enjoyed the article! I never thought Noah was a RIGHTEOUS man, but I certainly can see how some may have come to think he was from the translation of the Hebrew word into favor. It is very enlightening to see the first time the Hebrew word for Grace (favor) appears in the Bible was here! Thanks.